MaintenX and their employees enjoy watching Phillies Spring Training baseball and celebrating St. Patrick’s Day. 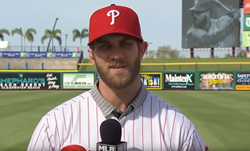 After 16 years of support, MaintenX enjoys watching the Phillies team grow and recruit new players like Bryce Harper. Just like the Phillies recruited Bryce Harper for a record-breaking deal to make him their star player, we make sure each new MaintenX team member understands they are a star as well. MaintenX team members enjoyed celebrating St. Patrick’s Day with the Philadelphia Phillies at their Spring Training headquarters in Clearwater, Fla. Dozens of team members enjoyed field-side access in the “Diamond Dugout” as they watched the Phillies take on the Yankees over the weekend. MaintenX has been a proud sponsor of Florida’s tradition of spring training baseball for 16 years. Enjoying a day watching baseball is only one of the benefits of being a MaintenX team member. Employees have unique onsite perks like car wash days, a full gym and sponsored team lunches. Team members also receive medical, dental and vision insurance, 401(k) options with a 5 percent match and immediate vesting, and paid vacations and holidays. All job opportunities are listed online at http://www.maintenx.com/career-opportunities. The exceptional team members at MaintenX have been providing superior maintenance services to facility managers for more than 40 years. From small repairs to total renovations, MaintenX technicians are ready and able to help. To learn more about MaintenX, visit http://www.maintenx.com.